This Villa is the perfect example of how you can make a luxury restoration, to be matched with tradition and comforts, in the middle of the countryside, but not too far from all services. The total area of the house is about 304 sq.m. in addition to a loggia and upper terrace for an overall area of 80 sq.m. The property consists of 4 bedrooms and 4 bathrooms (three are en-suite) one bedroom which is on the ground floor is used also as study at present. There is a large kitchen, consisting of custom built light oak furniture, the large central island has a stone work top with incorporated travertine sink designed for an exhibition by a sculptress. The two semi professional cookers (one electric with gas burners, one wood burning) are from the company De Manincor, who are famous for supplying to luxury homes and high class restaurants. The kitchen and spacious entrance hall blend together with the travertine stone floor emphasizing both light and space. Adjoining the kitchen there is the utility room with gas boiler (for heating radiators and water ), washer andfreezer . The living / dining space span the full width of the property, where the stone fireplace conceals the second heating system (wood burning ) which also heats the old style radiators and hot water supply. The flooring is of handmade terracotta tiles, all ceilings are lime wash painted beams.This living space leads out to the large covered loggia, whose shape recalls an ancient monastery serving as an additional entertaining & dining area. All three first floor bedrooms have high ceiling accentuating their ample proportions and light. The master bedroom and en-suite bathroom (with his and hers washbasins shower & bath) both lead out to the huge panoramic terrace.There are custom built cupboards providing ample storage throughout. The dependance (now used as a storage) measures about 20 sq.m. and could easily be an option for an independent living space creating a fifth en suite bedroom, equally this having a spectacular view of its own. The garden with many mature plants including Olive trees benefits from an irrigation system sourced from roof water & collection tank . The glass mosaic swimming pool is bordered by travertine stone and paved with antique bricks. A pergola provides a shaded lounging and BBQ area with the widest panorama of the countryside leading to the spectacular Sibillini mountains in the distance. There is a large “Orto” (vegetable garden inc. Olive & fruit trees) elevated from the rest of the garden by stone walls. 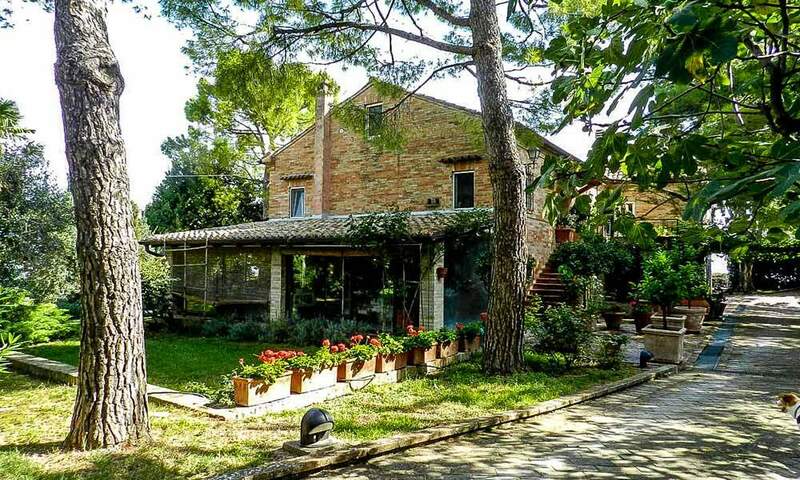 In addition to the mature garden, there is a 1 hectare agricultural land, which needs little maintainance and provides full privacy to the property. The construction of the property is to the highest structural standards, with high spec. roof insulation, the latest specifications in double glazing, internal and external shutters. This guarantees high living standards and also a certainty that it will keep the resale value over the years. Excellent luxury retreat for all those, who like to abandon the grey skies of big and noisy cities and enjoy a life closer to nature, but with all comforts.